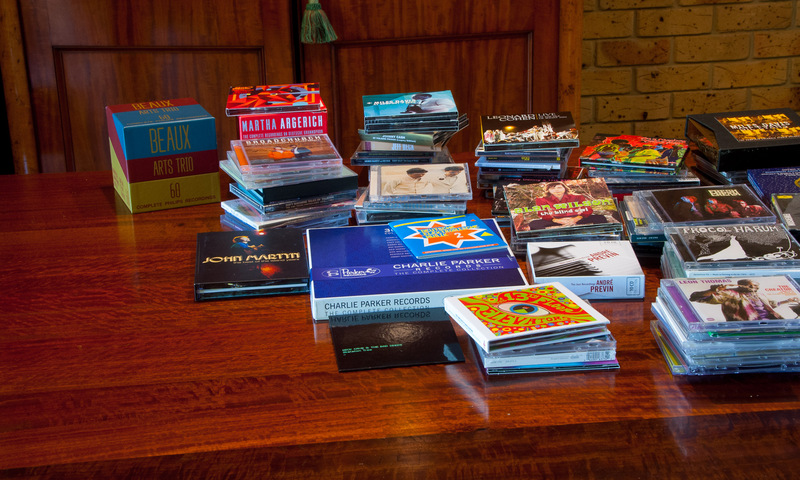 This is an illustration of AlbumPlays running in Last.fm mode; ie. the mode where you receive all of your track plays from Last.fm. Background: see here for a comparison of this operating mode, versus Spy mode (which is available to Sonos owners only). In that other mode non-Sonos plays are sourced from Last.fm, but Sonos plays are detected directly from the Sonos zones themselves. The wizard monitors your position in the processing cycle, and when you have completed one action, it will advance you to the next. 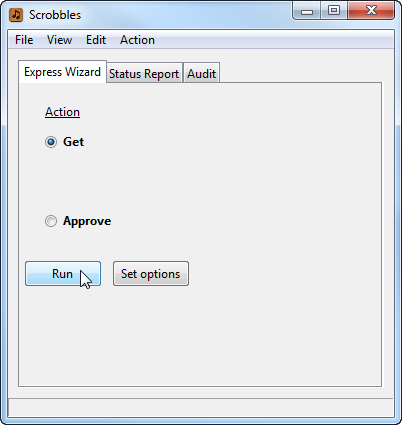 You may override the default position, to run successive Get actions without fear of overwriting any scrobbles. nb: click on any image for a larger view. The Wizard is poised to run the Get action. Press the Run button. A run log window opens, and the Get action commences. The log window has a white background while the task is downloads your new plays are downloaded. 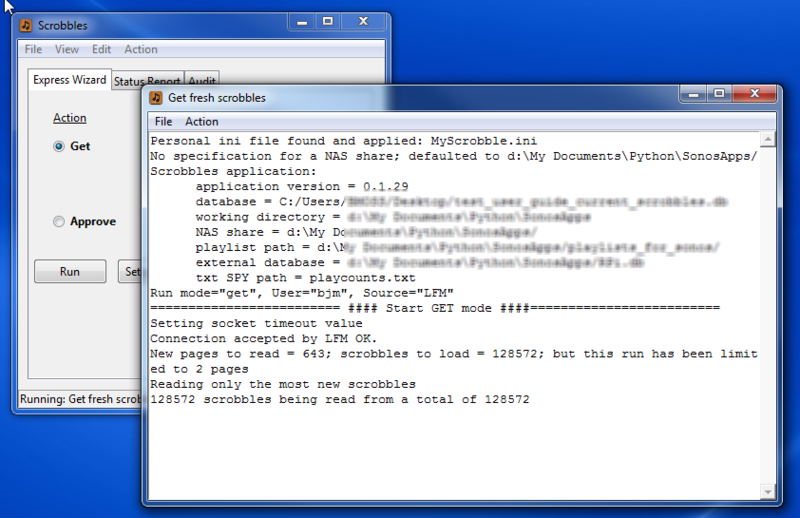 The log window turns black once the download has completed, and a run summary dialogue box is displayed. If it includes the blue “info” Windows icon (as shown on this illustration), the run completed without incident, and there is no need to review the log. The Status Report shows a summary of the fresh scrobbles. They are all unmatched at this stage, as they haven’t yet been processed against the MediaMonkey database. In this illustration there were no unmatched or missing tracks, so we have another run summary dialogue box with a blue “i” icon indicating that the batch of fresh scrobbles has been fully processed. 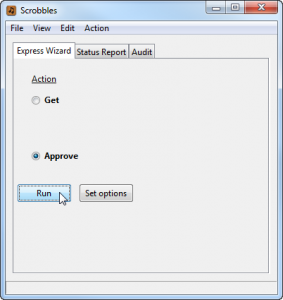 When you press the OK button to dismiss the Run Summary, the Wizard will advance ready for the next Get action. 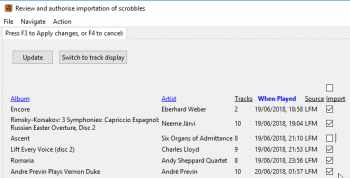 Once you have been using AlbumPlays for a while, you will have built up a set of rules to handle any cases where Last.fm is in disagreement with you, regarding how your tracks should be tagged. This should mean that you mostly get a clear run, as illustrated above. 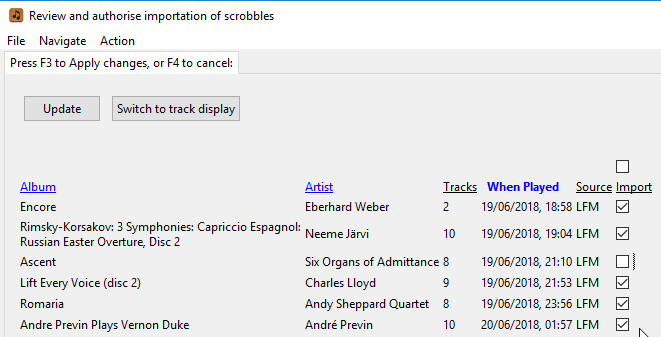 If any of the imported scrobbles cannot be matched to tracks in your MediaMonkey database, AlbumPlays does much of the heavy lifting for you. Mismatches may be due to a variety of causes, as discussed here. 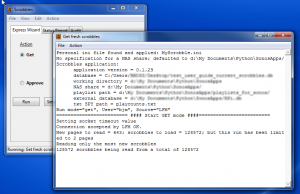 AlbumPlays has tools to detect and correct mismatches. Any fixes which you accept or make yourself, are retained, and automatically re-applied against any future unmatched scrobbles, avoiding future problems. … After you have made all of the fixes you feel are worthwhile, you can force-close the batch of fresh scrobbles. Any remaining unmatched scrobbles will automatically be discarded. If Last.fm begins to enforce a new tag auto-“correction” to one of your tracks, the simplest fix is often to just re-tag your track, and then re-run the AlbumPlays Approve action. Mismatches caused by LFM’s new corrections will be avoided. 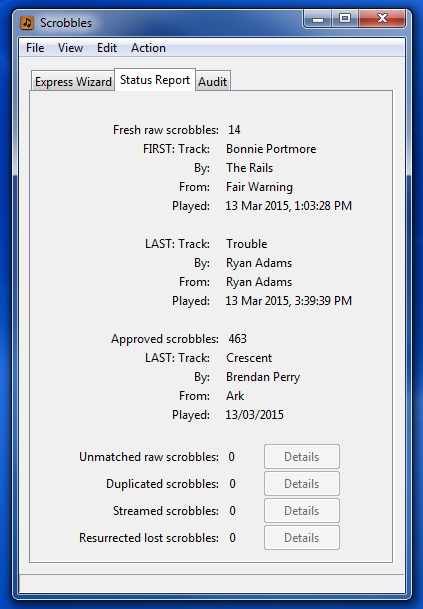 In this example AlbumPlays has been unable to find an acceptable match. If this an album which I own, I can type in my own tags, or cut and paste them from MediaMonkey. 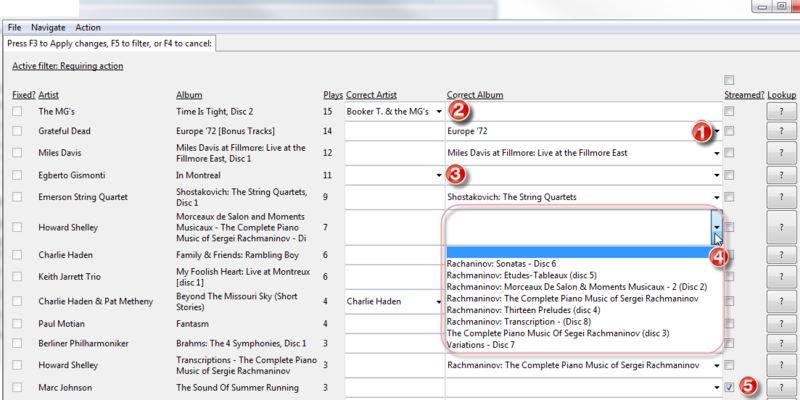 This row illustrates how AlbumPlays usually assists by providing a drop-down list of valid options for each mismatch. … AlbumPlays has been unable to find a close enough candidate to be confident, but it has loaded the drop-down list with all of my album titles for Howard Shelley, as you can see in the illustration. I only need to select the correct album from the list. 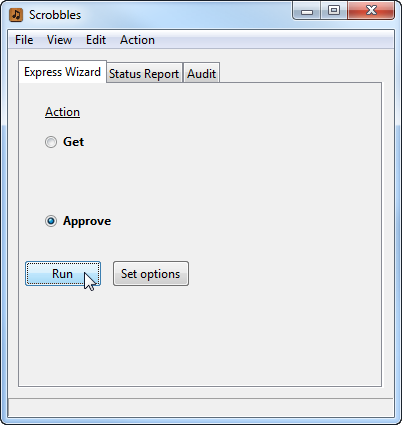 AlbumPlays can be configured to auto-apply the tag auto-corrections, or you may review them as illustrated above. You may reject or alter any suggested correction. 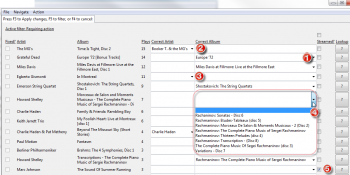 If AlbumPlays has been unable to offer a auto-correction, you may select your own from the drop-down combo-box, or type in your own correction using the keyboard. The rules shown in the above illustration are at the album level, so the one rule corrects all tracks from the album. There is a companion facility which offers the same facility at the individual track level for. 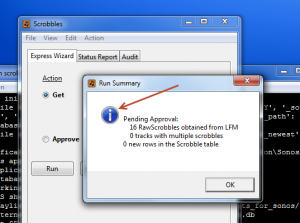 AlbumPlays can be configured to pause after identifying your fresh scrobbles, so that you may suppress the importation of any unwanted scrobbles. …. This is intended to handle situations such as where it was guests who generated the scrobbles, or the music was left running when you were away from the room. This optional facility may be configured to offer suppression at either the whole album, or individual track, level. The following illustration shows what happens when configured for a whole-album listener. 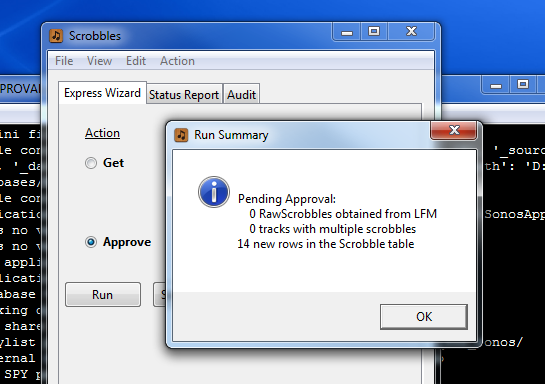 Where you uncheck a check-box, scrobbles for the whole album, from the current batch, will be suppressed. There is an AlbumPlays menu option (Action|AdoptStreamed…) for adopting Google albums or tracks, but adoption is also built into an optional part of the regular Approve action: the Streaming Wizard. 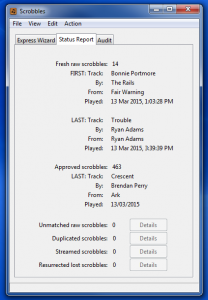 Where AlbumPlays detects unknown items within the batch of fresh scrobbles, it can pause to display the Streaming Wizard, to allow you to deal with any streamed items. Any changes made using the Streaming Wizard will trigger the Approve action to do an immediate auto-retry, trying to get a clear batch, so that it can be closed and MediaMonkey updated.